(Last Updated : 22.06.17). Navodaya Vidyala Samiti advertised Recruitment Notice for Contractual Teacher Posts for the session 2017-18 in Jawahar Navodaya Vidyalays situated in Chandigarh Region (Punjab, HP, UT Chandigarh), Jaipur Region (Rajasthan, Haryana and Delhi), Bhopal Region (Madhya Pradesh, Chhatisgarh & Odisha) and Pune Region. Eligible candidates are invited to attend Walk-in-Interview against various teaching posts (TGT & PGT) on contractual basis for the session 2017-18. 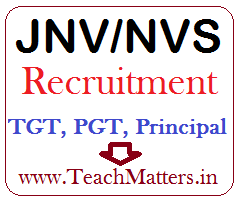 Here is the details like NVS TGT-PGT Contractual Teacher Recruitment Vacancy Details, Application Form, Eligibility Criteria, Educational Qualifications, Selection Process & Criteria, Interview Schedule & Result 2017. Subject-wise Posts of Post Graduate Teacher (PGT) : PGT English, PGT Hindi, PGT Physics, PGT Chemistry, PGT Maths, PGT Biology, PGT Economics, PGT History, PGT Geography, PGT Commerce, PGT Computer Science, PGT Bio-Technology, PGT Food Production & Beverages, PGT Information Technology etc. Subject-wise Posts of Trained Graduate Teacher (TGT) : TGT Hindi, TGT English, TGT Maths, TGT Science, TGT Social Studies etc. Subject-wise Posts of TGT Misc. Category : Art Teacher, Music Teacher, Physical Education Teacher etc. Note : Check concerned NVS Region website and advt. for more vacancies whose links are given at the end of the article. Candidates to report at the venue by 09.00 AM sharp on the date of interview with 02 passport size photographs, original certificates as well as one set of self attested photocopies of all the relevant documents i.e. Secondary, Senior Secondary, Degree, PG, CTET, B.Ed., NET/Ph.D./M.Phil. The cut-off date for determining various eligibility criteria i.e. Educational Qualifications will be the date on which the candidate is appearing for walk in interview for the post concerned. Two Year Integrated Post Graduate M.Sc. Course from Regional College of Education of NCERT in the concerned subject with at least 50% marks in aggregate. OR Master’s Degree from a recognized university with at least 50% marks in aggregate in the concerned subject. B.Ed. or equivalent qualification from a recognized University. Experience of working as TGT in a recognized institution in the concerned subject. B.Ed. or equivalent from a recognized University. Competence to teach through English and Hindi/Regional language as the case may be. Download application form or format for the concerned posts at below links for various regions. For other details visit official regional website of NVS as www.nvsrojpr.gov.in for Jaipur region or download the advertisement and other information.